This is an advanced 1 week writing class designed specifically for rising International Baccalaureate (IB) juniors and seniors. The class will focus on one of the books students have read in previous classes. We will discuss the academic writing process with a special focus on introductions, body paragraphs and secondary-source paragraphs, as well as conclusions. This course is highly recommended for all IB English students who wish to obtain extra practice in critical writing. Students will also gain a jump-start on the rigorous work involved in Higher Level IB English. This class is designed to raise the writing ability of every student, regardless of grade or skill level. The workshop will focus on note taking, critical reading and writing, outlining and researching. The instructor will provide individual attention to each student while teaching the importance of peer editing in a workshop environment. This class is highly recommended for any student who has struggled with his or her writing. Students who simply want to improve their writing skills are also encouraged to register. 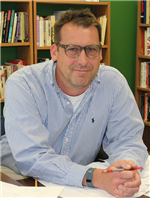 Francis Decker teaches English International Baccalaureate (IB) I and II, English Honors and Creative Writing. He has been an English instructor at both Virginia Commonwealth University and J. Sargeant Reynolds Community College and has taught at Trinity for 15 years. Francis is also a freelance writer for the Richmond Times-Dispatch, Richmond.com and Style Weekly Magazine.